Every time Bombardier releases a new model of the Learjet, it never disappoints. 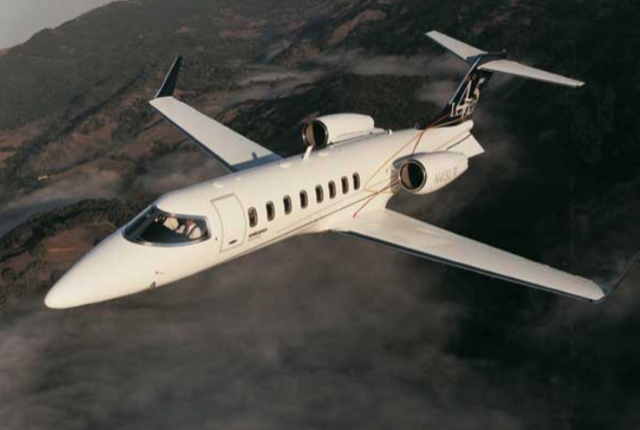 It is no different when it comes to the Learjet 45. The Learjet 45 does not stray from the original and successful design and Bombardier has impeccably assimilated new technology into this aircraft. Keeping with tradition the Learjet 45 has the speed and economy mixed with the luxury of a private jet that it is renowned for. Typically accommodating eight passengers, the cabin offers a double club layout, and plenty of room to swivel, recline and track the seats. The length of the cabin measures 19.8 with a width that measures 5.1, the height of the cabin comes in at 4.9, these measurements give the passengers as much usable space as possible. There is a separate lavatory located in the rear of the plane and the baggage compartment measures 50 cubic feet, providing ample luggage space. The Learjet 45 is a great aircraft for its class. It is reliable, has great fuel economy and features great performance. This jet is a viable choice for anyone that is in search for a high performing private jet. For more information on chartering a Lear 45, price out your flight here for an instant quote.